So I got an iPad. Don’t worry, I’ll spare you the fanboy gushing. I actually want to talk about Amazon’s Kindle service. I’ve been wanting to stop buying paper books for a while now. I’ve also been buying ebooks in PDF and ePub format. Reading these ebooks have been less than ideal because I’ve had to read them on my computer (inconvenient) or on my iPhone (too difficult). Knowing that I was getting an iPad, I started investigating iBooks–Apple’s ebook solution. The other contender was Amazon’s Kindle application. I couldn’t test iBooks since it only works on the iPad (which had not yet arrived) so I thought I would buy a Kindle book. I planned to start reading the book on my iPhone and finish it on the iPad. I bought Daemon by Daniel Suarez which I had heard rave reviews about and started reading on my iPhone. I found that I was reading more because I always had my phone with me and could whip it out to read anywhere–in the backseat of the car, in the dark room while waiting for baby Zack to sleep, at the in-laws when there’s nothing to do. If I had a hardcover book, I wouldn’t even have bothered to bring it along with me. By the way, I ended up liking the book so much that I finished it in 3 days and immediately bought the sequel, Freedom. The other really cool thing about the Kindle is that you can send yourself samples of a book. I’ve downloaded tons of samples that I can read before deciding if I want to buy the book. Reading reviews of books isn’t really the same as reading the 1st few chapters, so this feature is really great for me too. I’ve already started to read more with my Kindle service. 2 books in the last 2 weeks already and already itching to buy a few more. Compare that to the 3-5 books I have sitting on my bookshelf (which I bought!) that are still not read. The amount that I read has greatly decreased since finishing university and in the meantime the only things I read are articles on web sites and blogs which have completely spoilt my attention span and comprehension, so I’m definitely looking forward to reading more books on my iPad. Quick comparison to iBooks–Apple’s solution also allows you to download samples. However it’s more difficult to buy books (from Malaysia) because you need to have iTunes credit. Amazon also requires a work around but it’s generally easier to buy Amazon credit which I use to pay for the books. Plus, Amazon’s catalog is much wider and slightly cheaper. On the plus side for iBooks, the application is a lot more polished and it’s also easier to import books from other sources. Long story short, eBooks (digital format books) will hopefully get me reading regularly again. 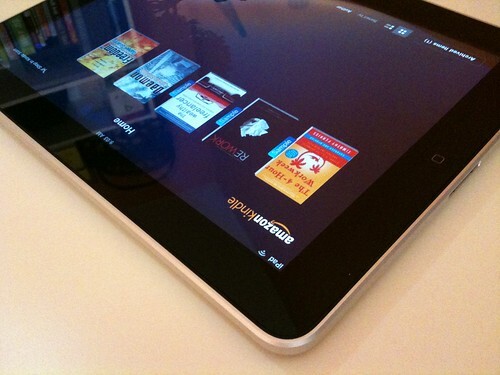 2 Comments on "Now I understand all the fuss about the Kindle"
can i buy recipe books too?